Welcome to March! It's really just one day later, and maybe it looks the same today as yesterday, but a simple flip of the calendar can make all the difference. Suddenly it seems like there is so much to do. Digging the garden, spring cleaning, maybe even shoveling snow. Whatever! It's time to march on! Everything is still pretty brown in our neighborhood. We have a local farmer who has turned his field. That always seems like some sort of signal. And it never fails to remind me of Edith Holden's drawing of March. A few days ago I was driving through the local fields when a huge flock of crows began flitting through the trees like this. They looked like swirling black confetti had been dropped from the sky. We have a beautiful warm week forecast ahead. I can't wait for the first blossoms of spring which, coming first, always appear as a great trumpet call announcing the season. Our month of March has arrived as gentle as a lamb. Spring is really on its way! It won't be long now! Isn't flea market style just another name for vintage? And aren't there tons of interpretations of style within vintage? And what makes prairie different from country anyway? And who decides? Golly gee! I have a friend who went to buy at a major furniture market a month ago where he was told that the buzz words for new furniture styles this year are Vintage Farmhouse and Rustic Country. I have found that many folks interpret painted furniture, especially white, as Shabby Chic style. A famous trademark name. 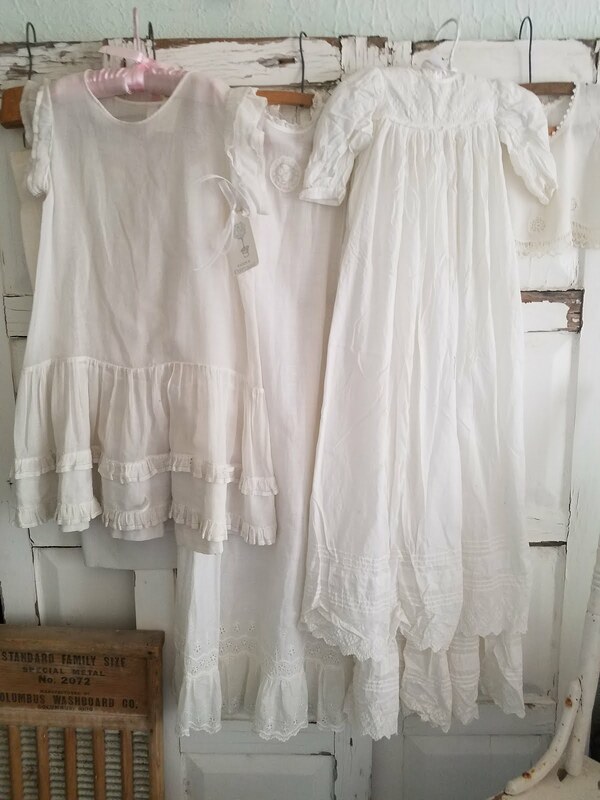 I love old stuff, so I shop where you find it. That's mostly flea markets. Call it what you want. This week I went looking for garden stuff. I hardly ever find what I'm actually looking for. But look at what jumped into my basket very first thing this time!? A couple of cement garden finials in white! I then headed straight to the nursery to cure a very bad case of spring fever. . . . This shot reminds me of Victorian flower paintings with very dark backgrounds, but it's just azaleas in late afternoon lighting. Okay, so I call it cottage. Always have. Always will. Thanks so much y'all for stopping by! The Water Babies by Charles Kingsley was a nursery staple in England long after it was first published in 1863. This copy, which turned up for me at the flea market this week, is inscribed "1923." Almost an antique at ninety years old! This fairy tale novel with a moral message has been through a great number of printings with various illustrators since then. W. H. Lister illustrated this copy, but I found that all but two of the illustrations have been removed. I bought it for two dollars, very close to its actual current value I imagine. But I see that it was once priced at thirty five. Seeing that it has no publishing date, I gave a look online to see if it was possibly a first edition. Almost four hundred entries later, and under hypnosis, I had to take a nap after all that scrolling! But I still didn't find my edition. No matter. I got it just for it's old book charm. Loretta Gardner was gifted this little gem for Christmas by her Mother in 1923. I love the dreamy bird and cloud sketches of the end papers. It seems to have been both very well read and cared for. Very well worn after nearly a hundred years! I also found it amusing to find water marks on the pages of a book with the title, The Water Babies. I never owned this book, but I have seen it in the collections of others. Tons of folks of a certain generation grew up with some edition of it on their shelf, and there are still tons in existence. Old children's books are so adorable! And the samples of other illustrations of this story that I saw on line are so fanciful. Did you have a copy as a child? The books we owned as a children can leave such a lasting impression. My Mother is long gone, but I can still hear her "reading voice" as she read to me as a child. I wonder if my own children will remember mine. . . .
We had a windy day here in the land of enchantment. A sure sign of spring coming on! Cheers to you! Are you ever struck by how when you get your haul home and lay it all out it sometimes tells its own story? I can tell it's a good picking day when people keep stopping to look in my basket. I've even made transactions standing right there. Oh what a game! (Folded square doilies, 1.00). I think these are supposed to be napkins. Pretty impractical. I have no idea yet what I will be doing with them, but don't they make a sort of pretty iris or lily looking flower? Or butterfly? I like the still life quality of these objects together. Their suggested relationships. 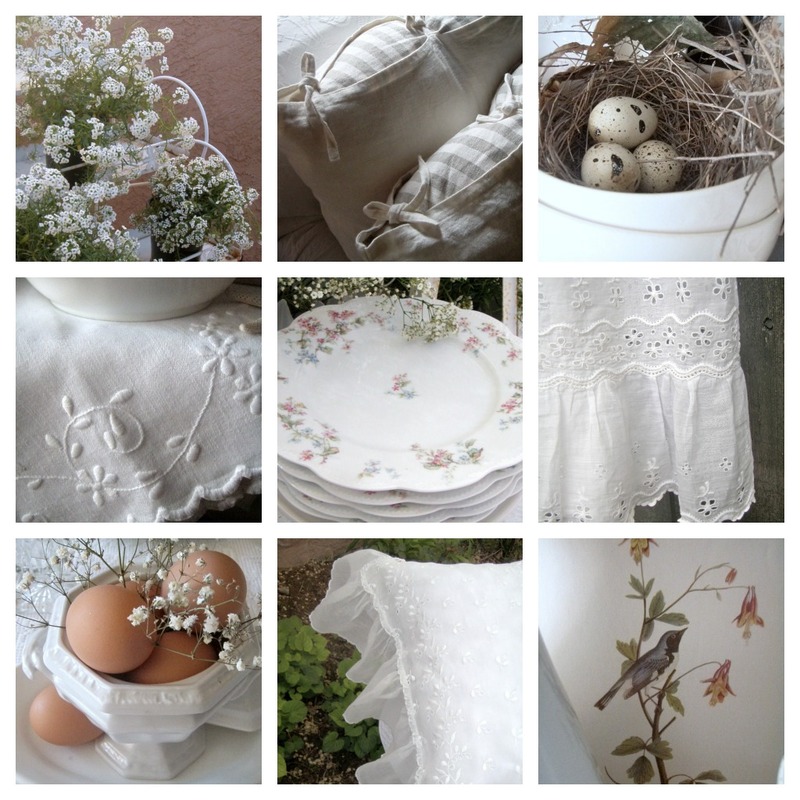 Weddings, lace, white, domesticity, basics like bread and butter, and salt. The romance of aged objects. Sepia tones. . . . I am enamoured of the secret textures of life. Its layered history. Its repeated cycles as narrated through meaningless ordinary commonplace objects. And most of all, its faces. . . .
Its frozen expressions peering earnestly through the ever turning, ever fading, ever mysterious leaves of time. . . .
And I'm even willing to go out of my way, to turn over miles of junk, and to get my hands utterly filthy in order to uncover it. I'll tell you about the old Water Babies book shown here too another time. We're done with the weekend wares for now! But what turned up for you? It seems like grey, blah days are the best for rummaging through piles if it's not too much of a mess to get out! It's Jenny Partridge weather! Low temperatures, a monotone landscape, and an overcast sky. . . With a name like Partridge it seems like destiny that you would become the author of books about Oakapple Wood with their nesty illustrations and woodsy characters. Delightful! Even her drawings seem nestled into nests! (For the record though, the illustration above is from Bird Egg Feather Nest, by Maryjo Koch, another wonderful illustrator.) But anyway, when is it not nesting weather? 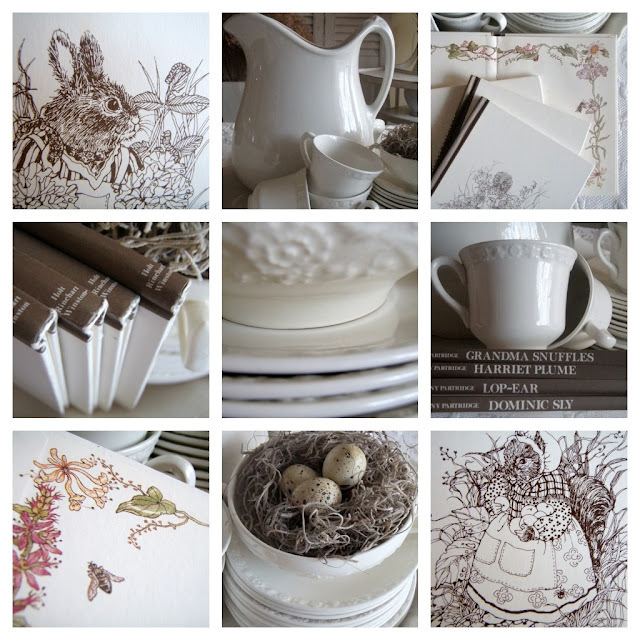 For your weekend nesting pleasure, I have put together a few pictures of eggs and nests with a few bunny drawings thrown in for good measure. A little hot tea, and buttered scones, and you're ready to settle down into a cozy little storybook tale for the weekend. . . . I can't wait until the landscape bursts forth with a little more color! In the meantime. . . let's hunker down! Hope you have a great weekend. . .